Yesterday it snowed. It rarely ever snows here in Victoria. At least not this time of year. And it was freezing cold. It was -6℃ and -14℃ with the wind chill, and there was 50-80 km/hr wind gusts happening at the same time. I know a lot of people would think those temperatures aren't a big deal, but you would if you were here to witness it. The cold here isn't the same as say, the interior or in the east. The cold here isn't a nice crisp cold that makes your nostrils stick together whenever you breath (like it did in Nelson, where I grew up...and I have to admit, I liked that feeling), the cold here is a wet cold that sticks to your bones and nips at you every chance it gets. That is, until my yarn ran out. Yes, I was stuck in traffic for a good 45 minutes and then had to wait in the car while Brett got the groceries (the kidlet was still sleeping and we didn't want to short-change his nap time!) without any knitting! Needless to say I was beyond bored! It's still quite cold outside, I don't think I'll be going out any time soon and apparently it's suppose to snow heavily again tonight. I think I'm going to put the kettle on, pull on some nice woolie socks and a hoodie, and play with some yarn. I'm sure the Munchkin wouldn't protest against that. Well, maybe that last part. that is so cool! I love the snow. 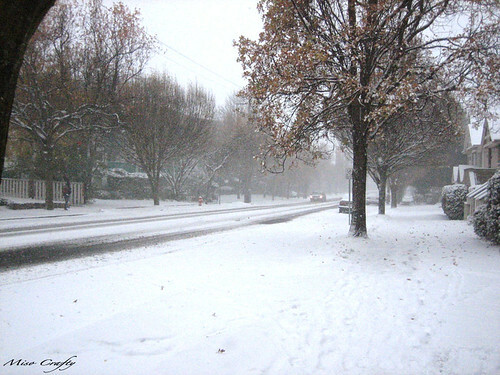 I just wish it would snow here but its not to be. I will always have to travel to get my snow fix! We've been experiencing some pretty chilly weather back in Iowa visiting our families... but I have a feeling we'll be getting snow soon out on the East Coast back home! And I can't wait!!! The snow sucked :( Unfortunately I am always the driver and only person in the vehicle, but you inspired me to keep a small project in the car now - you never know when I'll be stuck on the highway with the engine off! I guess cause I've grown up with quite harsh winter/snow conditions, that the novelty has worn off on me. Like the saying goes, you always want what you don't have is true! 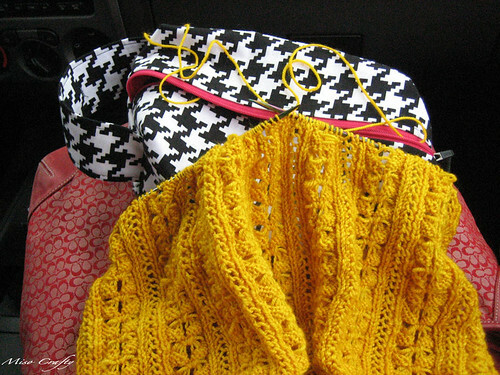 Yes, I ALWAYS make sure that I have a knitting project with me at all times. Especially when Brett used to have his old truck. That thing was so unreliable, that it worried me to go even a block without thinking it was going to break down!